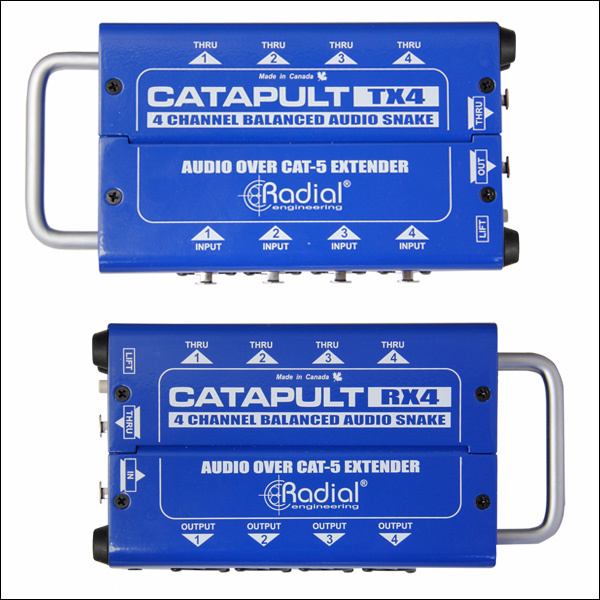 The Radial Catapult is a 4-channel audio snake that lets you send analog or AES digital audio signals over standard Cat 5 or Cat 6 shielded twisted pair cable. This allows stage techs to take advantage of the relatively low cost of this abundantly available cable for return snakes or for transporting balanced audio across a large stage. For the system contractor, the Catapult lets you take advantage of pre-wired networks to connect audio from one room to another. Six configurations are offered with a choice of three input modules and three output modules. Each input module features four XLR inputs, four XLR thru-puts along with two Neutrik Ethercon™ outputs to connect the Cat 5 cable to the desired output module. These are equipped with RJ45 type Ethercon input and thru-put plus two sets of XLR outputs. These may be ordered without transformers for sub-snakes or to transmit AES audio signals; with mic isolation transformers for signal splitting between FOH, monitors or the recording system, or with line level isolation transformers to eliminate system noise. A ground lift switch is provided at each end for the Ethernet cable connection to help eliminate hum and buzz caused by ground loops. As with all Radial products, the Catapult is constructed with solid 14-gauge steel to handle the rigors of live touring and is finished in a powder-coat finish to keep your Catapult looking good for years! Inside, a two-sided PCB is used to mount the connectors and transformers doubling up the solder joints for maximum durability.